Att'n Merchant applicants - the 2019 application will be available here soon, please check back. A huge heartfelt thank you to those who participated in the recent 41st anniversary of Chi Omega Christmas Market. As one of Dallas' most beloved holiday traditions, the Chi Omega Christmas Market is the kickoff to the holiday season for the entire Dallas Fort Worth Metroplex! The Market is sponsored by the Chi Omega Alumnae of Dallas. Chi Omega is the largest women's fraternal organization in the world. We are the largest organization in the National Panhellenic Conference in number of collegiate chapters, as well as number of members. We have 360,000 initiated members, over 28,000 collegiate members, 181 collegiate chapters and 246 alumnae chapters across the country. Our active collegiate chapters boast a 3.4 National Grade Point Average (Spring 2018). We so appreciate the Chi Omega Alumnae from all over North Texas who helped during Market week. Over 2,000 volunteer hours are required during the week of the show. This event could not happen without the support of the volunteers who work the Market and those who work year round. And to our shoppers, we couldn't support the local nonprofits without your help. In the past 41 years, we have supported 115 different agencies in the area with over $8.5 million dollars. We hope the Market was the perfect start to your holiday season and we thank you all for an amazing 41 years! It is our honor to have chaired the 2018 Market! The first Chi Omega Christmas Market was held in November 1978. Dallas Chi Omega Alumnae spent 2 years planning to get the first show off the ground. It was held at the old Dallas Convention Center. There were 49 booths and 14 double booths. One of the original Market Chairmen said, “Getting merchants for that first year was very hard! It took a real team of ladies to sell them on the idea.” That first Market was a tremendous success raising $13,150 for the Dallas community. In 1980 we moved to the 'Convention Center' Ballroom of the old NorthPark Inn. The Market grew and moved back to the Dallas Convention Center in 1987. We stayed there until 2012, then moved to our current home at Fair Park. The Market now has an extensive application process and a merchant waiting list, so we are able to bring you 180-200 of the best merchants around! COCM offers a unique one-of-a-kind shopping experience with merchants showcasing gifts for every age including holiday decor, women’s clothing and accessories, home accents, children’s clothing and toys, food gifts, and much more! 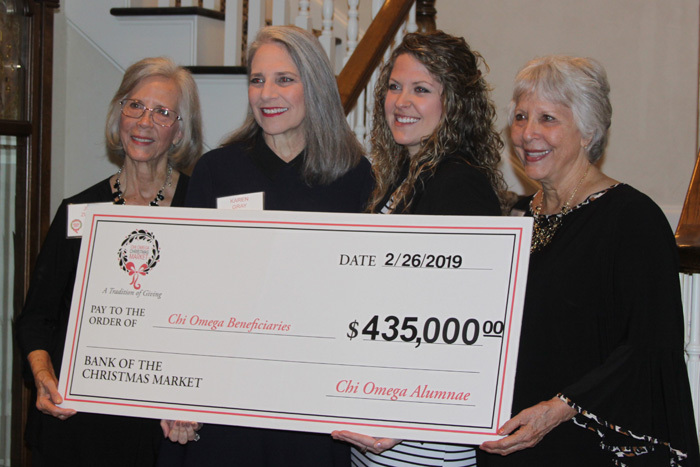 Funds for Chi Omega Christmas Market beneficiaries are derived solely from ticket sales, merchant booth fees, donations and underwriting. COCM receives no monies from merchant booth sales. The event has grown so much over its history that we now consistently give over $250,000 year after year. This is in large part due to the support of our 11,000+ shoppers each year. Please check out the Beneficiary Tab for insight into how the Dallas community has benefitted from the Chi Omega Christmas Market. We are thrilled to continue the tradition of giving again in 2019! Chi Omega active SCHOLARSHIPS are given yearly as well. See the General Info tab above > Scholarships.